MATCH (Memetic Algorithm and Combinatorial Optimization Heuristics) is a new memetic algorithm for automated sequence-specific polypeptide backbone NMR assignment of proteins. MATCH employs local optimization for tracing partial sequence-specific assignments within a global, population-based search environment, where the simultaneous application of local and global optimization heuristics guarantees high efficiency and robustness. MATCH thus makes combined use of the two predominant concepts in use for automated NMR assignment of proteins. Dynamic transition and inherent mutation are new techniques that enable automatic adaptation to variable quality of the experimental input data. The concept of dynamic transition is incorporated in all major building blocks of the algorithm, where it enables switching between local and global optimization heuristics at any time during the assignment process. Inherent mutation restricts the intrinsically required randomness of the evolutionary algorithm to those regions of the conformation space that are compatible with the experimental input data. 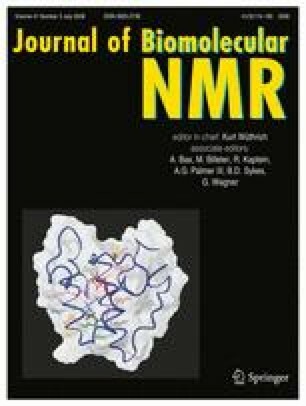 Using intact and artificially deteriorated APSY-NMR input data of proteins, MATCH performed sequence-specific resonance assignment with high efficiency and robustness. We thank Dr. B. Pedrini for sharing his experience with applications of MATCH for backbone resonance assignments in a variety of proteins. Financial support by the Schweizerischer Nationalfonds (project 3100-AO-113838) is gratefully acknowledged.